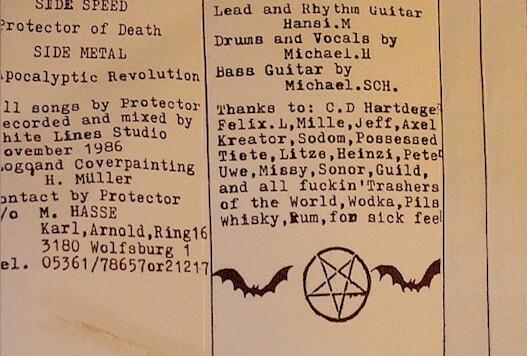 In the summer of 1986 drummer/vocalist Michael Hasse, who had just left Wolfsburgs first Speed Metal-band DEATH ATTACK, and guitarist Hansi Müller decided to form a Thrash Metal-band, and to name it PROTECTOR. They teamed up with bassplayer Michael Schnabel, started writing songs and rehearsing them at Michaels parents little summer-house in a village outside of Wolfsburg. In November '86 they went into the "White Line Studio" in nearby Braunschweig, where they recorded a demo that contained the two songs. In the beginning of 1987 Ede Belichmeier replaced Michael Schnabel on bass, and some weeks later vocalist Martin Missy joined the band. Just a few months after that Protector got in contact with "Atom H", a new-formed record-company, that had been started by Jürgen Engler. In May the band recorded a 6-track rehearsal named "Kain and Abel" - in their rehearsal room, mainly so that the people at Atom H could get an idea of what the new songs would sound like, but it was also possible for fans to buy the tape. They would also record a few live tapes which were not official demos. 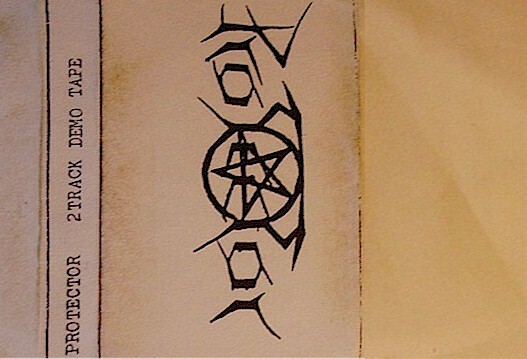 In the end of June / beginning of July Protector entered the "White Line Studio" again, this time to record their first vinyl "Misanthropy", a 6-track-Mini-LP, that hit the stores in early fall that year. Xeroxed covers. No lyrics. Recorded onto black studio tapes. This cover is the original. Nothing on the back. Xeroxed covers. No lyrics. This cover may be a bootleg. The cover is one long piece of paper which is folded around to make the back. Xeroxed covers. No lyrics. Recorded onto regular tapes.